Welcome to Oishi Sushi King’s Halloween Costume Contest! 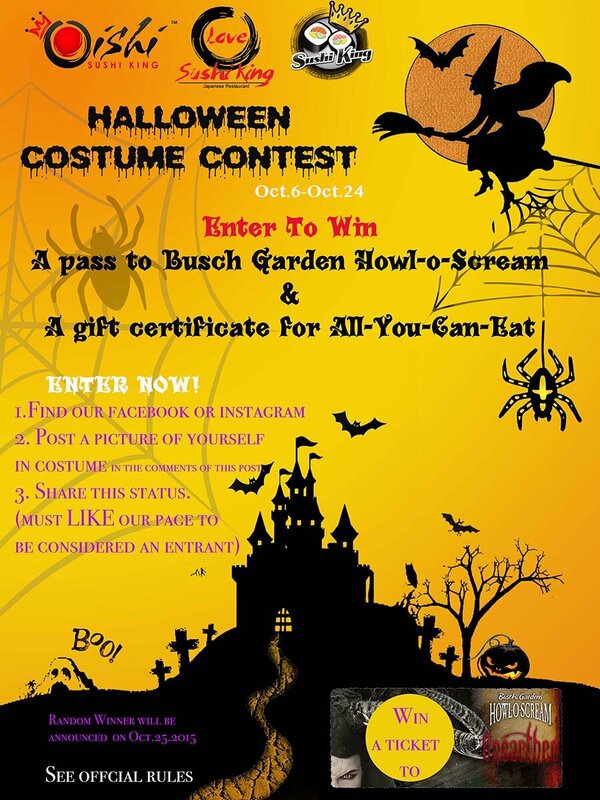 Want to WIN A PASS TO BUSCH GARDENS Howl-o-Scream & a gift certificate for an ALL-YOU-CAN-EAT DINNER at Sushi King? POST a photo of yourself in your costume in the comments of this post. Then SHARE this status! (Note: must LIKE this page to be considered an entrant). Random Winner will be announced on Oct.25.2015. WHO ARE WE? Oishi Sushi King is a sit-down restaurant – not a buffet. You order from a menu – anything you want – and you eat until you are full! Come check us out and see what all the Hub-Bub is about! Please SHARE with your friends and encourage them to LIKE our page, as well! We frequently run contests on our Facebook Pages. Hurry over and see how you can free dinner! No purchase or payment, of any kind, is necessary to enter or win. Our contests are sponsored SushiKingUSA.com (“Sponsor”). All contests are governed by these official rules (“Official Rules”). By participating in a contest, each entrant agrees to abide by these Official Rules, including all eligibility requirements, and understands that the results of the contest, as determined by Sponsor and its agents, are final, in all respects. The contest is subject to all federal, state and local laws and regulations and is void where prohibited by law. Promotions are in no way sponsored, endorsed or administered by, or associated with, Facebook. Any questions, comments or complaints regarding the promotion will be directed to Sponsor, not Facebook. Any contest is open to legal residents of their respective countries where not prohibited by law, who are eighteen (18) years of age, or older, at the time of entry who have Internet access and a valid e-mail account prior to the beginning of the contest period. All eligible entries received during the Submission Period will gathered into a database at the end of the Submission Period. A winner will be chosen at random. Each entrant is responsible for monitoring his/her Facebook account for prize notification and receipt or other communications related to this contest. If a potential prize winner has not acknowledged and claimed prize, within fifteen (15) days, that potential prize winner shall forfeit the prize. Incidental expenses and all other costs and expenses which are not specifically listed as part of a prize in these Official Rules and which may be associated with the award, acceptance, receipt and use of all or any portion of the awarded prize are solely the responsibility of the respective prize winner. All Federal, State and Local taxes, associated with the receipt or use of any prize, are solely the responsibility of the winner. Prize is transferable. No substitution or cash equivalent of prizes is permitted. By entering the Contest, each entrant agrees to indemnify, release and hold harmless sponsor and its parent, affiliate and subsidiary companies, the Facebook platform, administrator, advertising and promotional agencies, and all their respective officers, directors, employees, representatives and agents from any liability, damages, losses or injury resulting in whole or in part, directly or indirectly, from that entrant’s participation in the Contest and the acceptance, use or misuse of any prize that may be won. By participating, each entrant grants Sponsor permission to use his/her name, likeness or comments for publicity purposes without payment of additional consideration.